Occasionally, even an experienced mechanic is unable to fix a broken down snowmobile out on the trail. In this circumstance, towing becomes the only remaining option to get the sled back to the trailhead. Remove the hood of the snowmobile and take off the drive belt. This will allow the track to turn freely without damaging the engine. Leave the belt in the engine compartment so that it is available later and close the hood. Tie your tow rope from the back of the running sled to one of the skis of the broken sled. 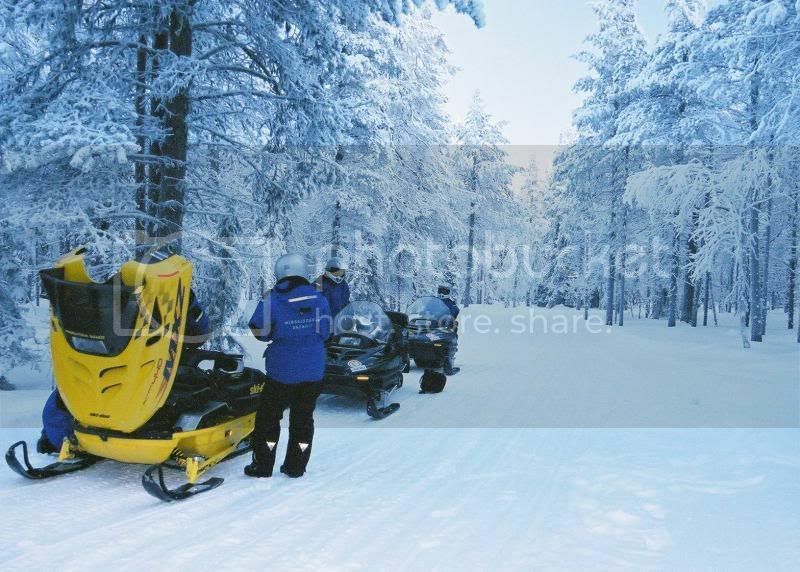 Have a rider sit on the broken snowmobile to help steer and brake. If you are doing this process alone, exercise caution and go slowly. Start the lead sled and proceed to the trailhead. 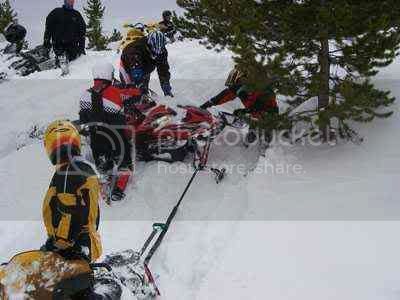 Keep an eye all the while on the trailing snowmobile and its rider. 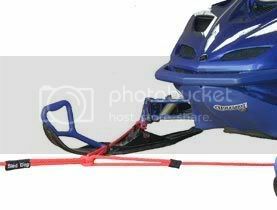 There are some products on the market that make it real easy to hook up a rope to the skis on your sled. Look at the samples below. You could also make a rig like this using rope. You can use a scrap piece of strong rope about six feet long for your tow rope. Climbing webbing works well as it packs up tightly. On days with deep fresh snow, towing is best left until the trails are packed out a bit by other users. Remember that your reaction ability is greatly reduced with another sled behind you - take corners wide in case of other users coming down the trail. 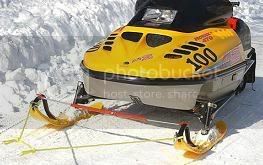 If you have to tow a sled without a rider, stop in a slower manner than usual: the trailing sled can hit you from behind.